Yr Ysgrwn, the Grade II listed farmhouse that was the home of Welsh poet Hedd Wyn, is to become a museum. The house, near Trawsfynydd in Gwynedd, will be transformed following the grant of £150,000 from the Heritage Lottery Fund. 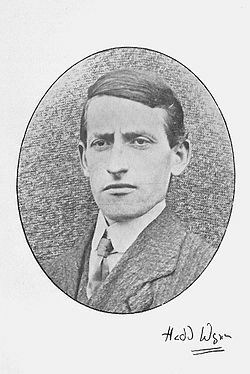 Hedd Wyn’s real name was Ellis Humphrey Evans and he was an established poet when he joined the 15th Battalion of the Royal Welch Fusiliers. He was killed in action at Pilkem Ridge in July 1917. ‘We started over Canal Bank at Ypres, and he was killed half way across Pilkem. That September it was announced Hedd Wyn had won the National Eisteddford – the prize for which was an oak chair. When it was discovered the winner had been killed the chair was draped in black. The chair is now on display at Yr Ysgrwn. This entry was posted in Events and tagged 1917, Hedd Wynn, London Welsh, Pilkem Ridge, Poet, poetry, Royal Welsh Fusiliers, Wales. Bookmark the permalink.